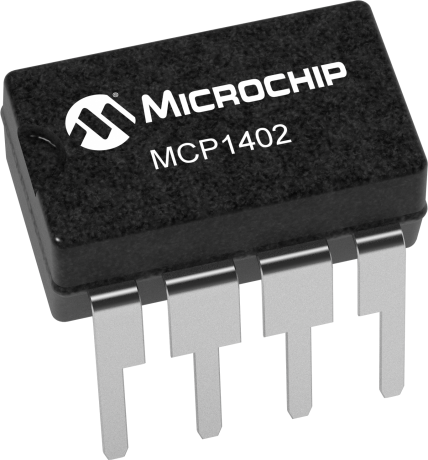 The MCP1401/02 are high-speed MOSFET drivers capable of providing 500 mA of peak current. The inverting or non-inverting single channel output is directly controlled from either TTL or CMOS (3V to 18V). These devices also feature low shoot-through current, matched rise/fall times and propagation delays which make them ideal for high switching frequency applications. The MCP1401/02 devices operate from a single 4.5V to 18V power supply and can easily charge and discharge 470 pF gate capacitance in under 19 ns(typical). They provide low enough impedances in both the On and Off states to ensure the MOSFET’s intended state will not be affected, even by large transients. These devices are highly latch-up resistant under any conditions within their power and voltage ratings. They are not subject to damage when up to 5V of noise spiking (of either polarity) occurs on the Ground pin. They can accept, without damage or logic upset, up to 500 mA of reverse current being forced back into their outputs. All terminals are fully protected against Electrostatic Discharge (ESD) up to 1 kV (HBM) and 300V (MM).